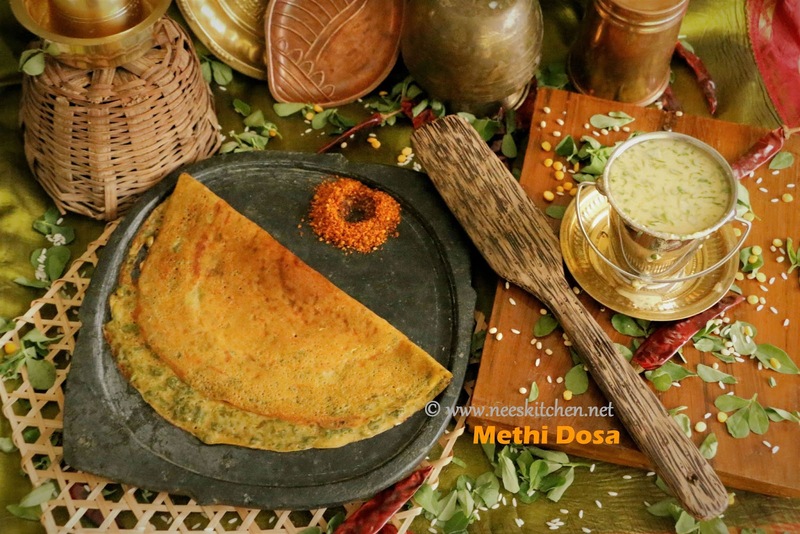 Today’s dish is Methi dosa which is very famous in Karnataka. 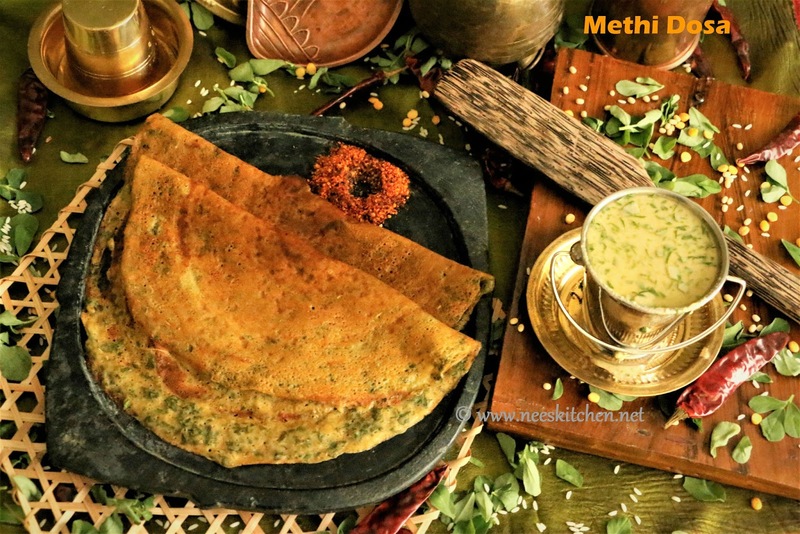 Methi leaves are combined with rice,urad dhal, Channa dhal, coconut , coriander seeds, cumin seeds,tamarind, jaggery &dry chili to get this batter. The taste is sweet, sour, bitter and spicy with these ingredients. Though we get enough supply of methi leaves in Singapore, I have to go to Little India all the way. Hence I just buy them in batch and store for 2 weeks. Remove the stem and store the leaves in a plastic box with kitchen tissue paper wrapped on the bottom and sides of the box. Check them once in two days and shuffle them. The methi leaves will be fresh for 2 weeks. Wash them only when you want to use. This recipe is again a video recipe, hence I have cut short the post with only video’s as it makes it more clear to understand. All my recipes will be changed to video version hence subscribe to my youtube channel to get a quick glimpse of my videos. 2. In the meanwhile wash and chop methi leaves very finely. 3. Soak tamarind in enough water. Squeeze them and keep it ready. 4. After 3 hours, grind together rice, urad dhal,channa dhal, red chili, coriander seeds, coconut, and cumin seeds in a mixie. 5. Transfer the batter to a bigger container and add salt, powdered jaggery, finely chopped methi leaves and tamarind water. 6. Mix well. Now the batter is ready. 7. Take a non-stick pan and once it is hot add butter or oil. 8. 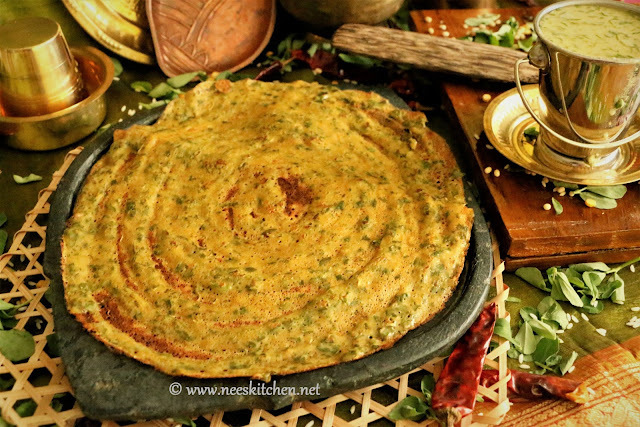 Pour the batter and make them as a dosa. 9. Flip after once side is cooked and cook the other sides. 10. Serve hot with a chutney powder or any chutney of your choice. 1. The final batter must be like a dosa consistency. Hence adjust water accordingly.